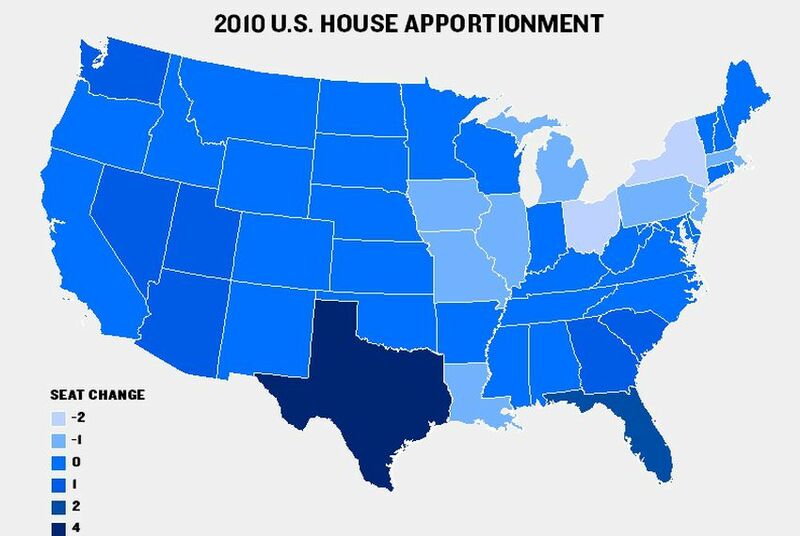 Texas will get four extra seats in the U.S. Congress in the decennial apportionment process, bringing the total to 36, the U.S. Census Bureau announced today. Texas will get four more seats in the U.S. Congress in the decennial apportionment process, bringing the total to 36, the U.S. Census Bureau announced today. The announcement reflects Texas' increased population, which has grown to about 25 million people — a 20 percent increase since 2000. (The population grew 23 percent from 1990 to 2000.) It also means Texas should get increased clout in the U.S. House of Representatives beginning in 2013, after the new representatives are elected to the seats that will be drawn during the upcoming legislative session. Texas, which has received new seats in each of the last seven decades, received more this time than any other state. Several states, including Michigan, Iowa and Louisiana, actually lost representatives in Congress because of declining population. You can track all the changes — and how they compare historically — with this interactive graphic. Read the bureau's full release.